Grewia Linn., Sp. Pl. 964. 1753. Gen. P1. ed. 5.412. 1754; DC., Prodr. I :508. 1824; Benth. & Hook. f., Gen. Pl. 1:233. 1862; Boiss., Fl. Orient. 1:843. 1867; Masters in Hook. f., Fl. Brit. Ind. 1:383. 1874; Narayanswami & Rao in J. Ind. Bot. Soc. 29 (4): 177-190. 1950; Hutch., Gen. Fl. P1. 2:487. 1967. Small trees or shrubs, rarely subspreading or climbing, with stellate hairs. Leaves alternate, petiolate, entire or serrate, rarely lobed, 3-7-costate, somewhat coriaceous; stipulate. Inflorescence axillary or leaf-opposed, solitary or clustered, pedunculate, umbellate cymes or panicles. Flowers bisexual, pedicellate, yellow, orange, pink or white, pentamerous, bracteate. Sepals 5, free, leathery, mostly coloured and almost glabrous within, valvate. Petals 5, very rarely absent, free, mostly shorter than the sepals, clawed, claw thick, pitted or glandular near the point of insertion at the base of often glandular-hairy torus. Stamens numerous, free, inserted on the more or less elevated torus or androphore; anthers somewhat orbicular. Carpels 2-4, syncarpous; ovary superior on top of androphore, 2-4-loculed, each locule with 2 or more superposed ovules; style subulate, with 2-4-lobed stigma. Drupe yellow, red or violet, globose, entire or up to 4-lobed, containing 1-4 pyrenes, each stone 1 or 2-seeded, rarely more seeded and often transversely septate (locellate) between the seeds. Seeds suberect or horizontal, with copious to hardly any endosperm; embryo straight, with thin foliaceous cotyledons. A genus with about 150 species; distributed in tropical and subtropical Africa, Asia and Australia. Grewia sapida Roxb. ex DC. Grewia bicolor Juss. = Grewia damine Gaertn. Grewia corylifolia A. Rich. = Grewia villosa Wild. Grewia echinulata Delile = Grewia villosa Wild. Grewia hainesiana Hole = Grewia asiatica Linn. Grewia laevigata non Vahl; Masters = Grewia glabra Bl. Grewia orbiculata G. Don = Grewia villosa Wild. 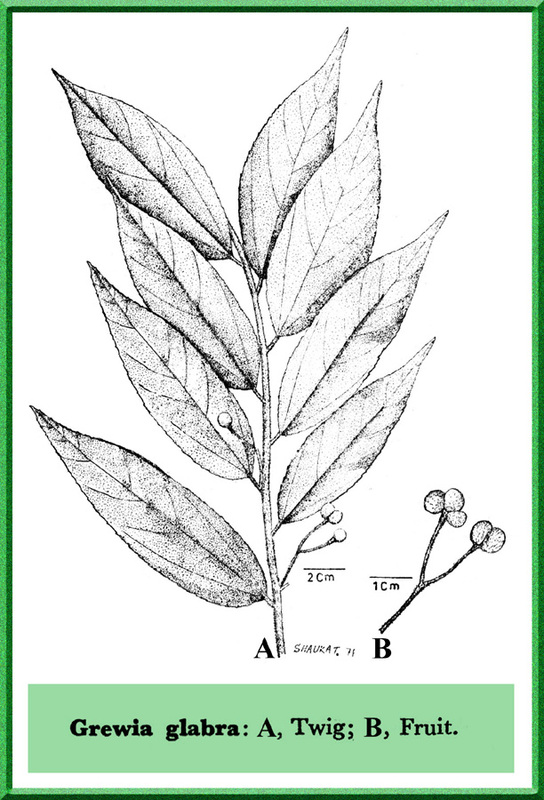 Grewia salvifolia Heyne ex Roth = Grewia damine Gaertn. Grewia subinaequalis DC. = Grewia asiatica Linn. Microcos paniculata Linn. = Grewia microcos Linn.